Deskew function It automatically synchronizes the time delay of RGB signals to compensate for distance. On Screen Display (OSD) Conveniently adjust video quality with the intuitive OSD menu system. Adjustable gain control It is manually adjust signal strength to compensate for distance. Dual console operation It controls your system from the local and remote keyboard, monitor, and mouse consoles. Dual console operation Control your system from both the local and remote USB keyboard, monitor, and mouse consoles. Deskew function Deskew function automatically synchronizes the time delay of RGB signals to compensate for distance. RS-232 serial ports RS-232 serial ports allow you to connect to a serial terminal, or serial devices such as touch screens and barcode scanners. Audio enabled Supports stereo speakers and microphone. Easy to install No software required. Connecting cables to the devices is all it takes. 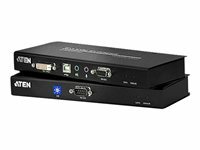 Dual console control ATEN KVM extenders support a PS/2 or USB console at both the local and remote locations. Depending on what is most convenient at the moment, the computer can be controlled from either console. 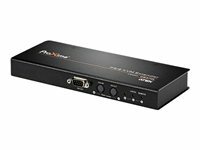 Real-time monitoring over greater distance at less cost Use of inexpensive Cat 5e cable to connect the local and remote units instead of the expensive bulky cables used by traditional KVM extenders means that you can extend the distance between the units a great deal further while saving on cabling costs at the same time. Superior CD audio quality To ensure audio quality, analog signals are converted to digital signals. This reduces electromagnetic interference and provides better CD audio quality. 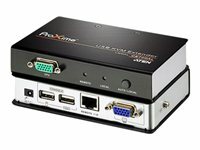 RS-232 serial connectivity Incorporation of an RS-232 serial port provides the ability to integrate serial connectivity devices - such as barcode scanners, POS terminals, kiosk touch screens, etc. - as part of the extender installation. Exceptional video Automatic signal compensation is designed into the extender. 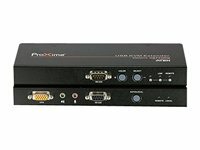 The video signal strength is automatically adjusted to compensate for the distance between the computer and the console so the quality of the display doesn't deteriorate as you get further from the source. The result is clear, sharp, video at all supported distances. Automatic gain control Adjusts signal strength to compensate for distance. 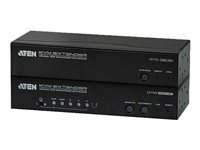 Rack mountable, easy to install No software required - connecting cables to the devices is all it takes.